This Friday, Blumhouse Productions will release a film titled "The Green Inferno," directed by Eli Roth. The film depicts a group of student activists who travel from New York City to the Amazon forest to "save" a tribe. Their plane crashes, and the tribe takes the group hostage and engages in cannibalism, killing them one by one. Yes, you read that right - in 2015, the silver screen will present the story of American saviors who go to the rainforest to save an uncivilized tribe, but the tribe shows how savage it truly is and turns on said saviors. Racist portrayals of indigenous people are all too common - whether it's a sports mascot perpetuating the noble savage stereotype or a grunting buckskin-clad brave brought to life by Hollywood, America refuses to let go of the ideology that Native Americans are a people of the past. 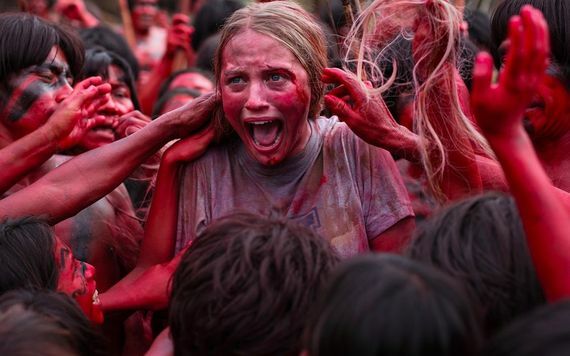 "The Green Inferno" takes it up a notch. Why feature historical tribal savages when you can set the story in modern times and show the tribe actually eating people? Indignation about the incredibly offensive depiction of indigenous people aside, this couldn't have come at a worse time for real-life Amazonian tribes. But therein lies the harm - in the midst of competing interests to protect indigenous peoples or capitalize on the Amazon's natural resources, out comes a film portraying tribes as bloodthirsty savages. Despite Roth's assertion that a fictional film causing harm to existing peoples is "absurd", presenting an at-risk population as cannibalistic beasts feeds into the mantra of saving, assimilating and educating uncivilized tribes for their own good (and the good of resource-hungry corporations). Stereotypes and dehumanization have very real consequences. Roth himself joked about the impact of his film crew to the Amazonian tribe he located and featured in his film, "We [had] to tell them what a movie is...They've never even seen a television...[B]y the end they were all playing with iPhones and iPads. We've completely polluted the social system and f*cked them up." These days, Roth is attempting to soothe the many environmental and indigenous rights organizations that have denounced his impending film. He's joined a campaign to preserve the rainforest and partnered with a charity to start a journalism fund highlighting the issues faced by indigenous peoples. He recently told Variety he "made 'The Green Inferno' to spark discussion and bring awareness to the devastation these tribes face at the hands of corporations." That's a far cry from a man who earlier stated that he wanted to make a cannibal film but needed the right storyline. The Paiute Tribe of Utah impeached the tribal chair earlier this summer for accepting bribes from the foundation, and just last month the Cheyenne River Sioux Tribe rejected $25,000 offered by the Redsk*ns organization. Even if it's paid for, racism is still racism. The almighty dollar doesn't mitigate dehumanization. If Roth has concerns about the plight of Amazonian tribes, perhaps he could use his platform to expose the threats to their homelands and way of life instead of portraying them as animalistic cannibals. To show your support for halting distribution of "The Green Inferno," a petition can be found at causes.com. *Note: this post originally appeared in Indian Country Today.